This year marks Make-A-Wish® Guam & CNMI’s 30th anniversary. Thirty years and 289 magical and life changing wishes that have been granted to our islands’ children. Wishes that have brought joy, hope, and treasured memories to critically ill children and their families. The organization celebrated in a big way at their annual gala, held on Saturday, August 25th, 2018 at the Hyatt Regency Guam. The sold out, black-tie and tennies event, themed "Evening of Wishes", featured a five-course plated dinner, open wine table service, live entertainment and raffle prizes throughout the evening. One of the highlights of the gala was a chance to win a 2019 Kia Soul EX with a retail value of $25,000, compliments of Triple J Auto Group. There were only 400 chances to win, and one person won big that night. 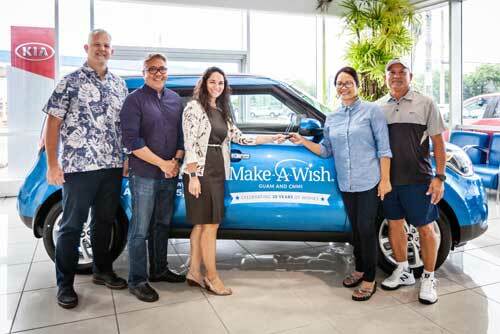 Leah Duenas accepts the keys to her 2019 Kia Soul EX, from Triple J and Make-A-Wish at the Triple J showroom on August 31st. Standing left to right, Jay Jones, Senior VP of Triple J and Vice Chair of MAW; Eric Tydingco, President & CEO of MAW Guam & CNMI; Ana Marie Gayle, Chair of MAW; Leah Duenas, winner, and her husband Alvin.